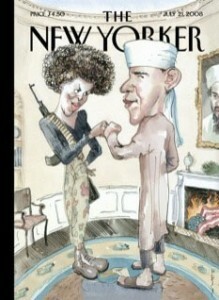 Obama, fist bumping with a terrorist in the oval office. (Gee, didn’t the most recent Democrat president, Bill Clinton, do that, where the terrorist was Yassir Arafat? ) A flag burning in the fireplace. Bin LAden’s portrait on the wall. Here’s someone who clearly is disconnected from reality. I suppose we can’t expect much better from someone drawing pay from the New Yorker. 1.	the use of irony, sarcasm, ridicule, or the like, in exposing, denouncing, or deriding vice, folly, etc. 2.	a literary composition, in verse or prose, in which human folly and vice are held up to scorn, derision, or ridicule. 3.	a literary genre comprising such compositions. I’m sure we’ll be advised there some deeper menaing, and that the whole thing is the fault of Chimpy McBush and Hitler Haliburton McCheney. It’s jolly well inevitable of late that when liberals get backed into a corner to blame their nemisis, after all. In the end, however, the reason any humor, particularly satire, works is because there’s a grain of truth at the center of it. The level of anger coming from Camp Obama on this thing indicates they think so, too. Don Surber, Riehl World View, BLACKFIVE, Macsmind and Flopping Aces, Gateway Pundit, The Volokh Conspiracy, Althouse, The Strata-Sphere, QandO Ben Smith’s Blogs Michelle Malkin, and Memeorandum all have more.